I then often tell the student that the only way to reduce nervousness is to give talks as often as you can. But I also want to tell them something else, which is maybe more important, namely that being nervous should not keep you from giving a good or even great presentation. If you want to improve your talks, you can focus on a better story, or simpler slides, but don’t try to not be nervous. It’s not necessary and it won’t work anyways. If your talk is well prepared and if you manage to get your message across, then nobody in the audience cares about whether you are nervous or not. Even if it is obvious that you’re nervous, people understand and will not judge you. On the other hand, if you are not well prepared, if you take more time than allotted, if your slides are full of long sentences and the axes of your plots are unlabeled, then the audience will be annoyed. I recently watched Emma Watson’s speech for the UN about feminism. It became a huge hit on the internet. My Facebook and Twitter feeds were full of it. But did you notice how nervous she was? However, it didn’t matter that she was nervous, because she had an important message, a good story, she was well prepared, she paused at the right places and she stood tall. In the end, her being nervous was no problem at all. She got her message across. It is possible that the epidemic is still growing exponentially, and the reported numbers do not reflect the real situation. Alternatively, the epidemic is really not growing anymore. Let’s hope it is the latter! 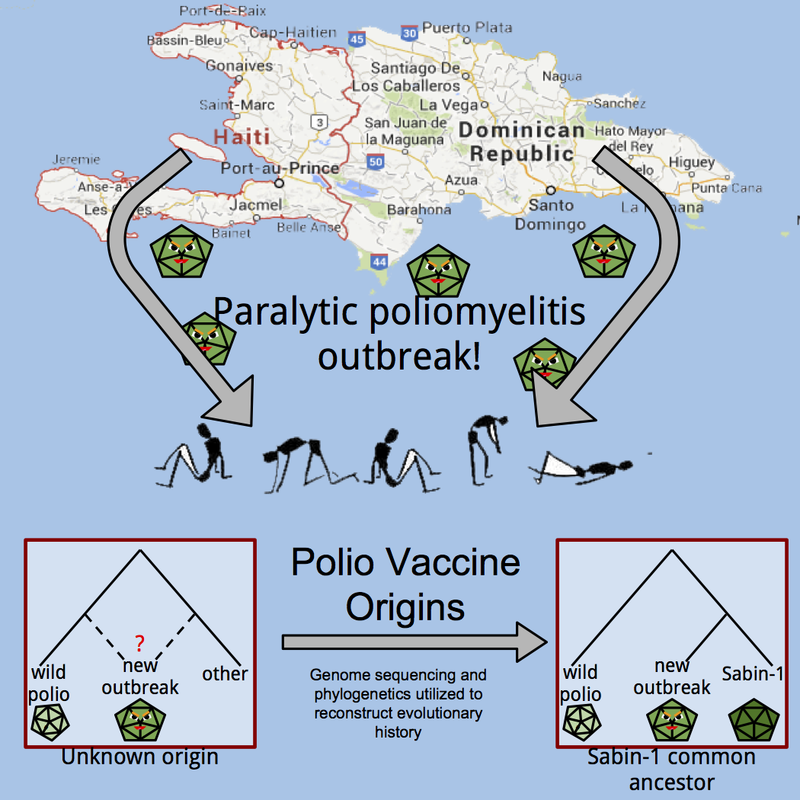 Last week we read a paper about an outbreak of vaccine-derived polio virus in Dominican Republic and Haiti in 2000 – 2001. Such outbreaks are uncommon, but they do happen. For me, this paper made clear that no vaccine is 100% safe. As an evolutionary biologist, I find it exciting that it may be possible to study how the attenuated virus evolves to become virulent again. Here is some of the homework from the students in my class. What kind of data are used in the paper? Most of the data used in this paper were viral isolates obtained from the stool samples of two patients in the Dominican Republic and Haiti. These were collected (presumably) by the authors because the patients were exhibiting signs of Acute Flaccid Paralysis (AFP). Individuals can have nonpolio AFP, but these two patients were exhibiting characteristics that led the authors to believe their AFP was caused by wild poliovirus, of which very few infections had been observed since the 1980’s. Nucleic acid probe hybridization identified Vaccine-Derived Polio Virus (VDPV) in these samples. They then performed a sequence characterization of the major capsid surface protein VP1 and compared the isolates from samples to wild-type. The authors looked for more polio cases in the area, and obtained 31 more samples from which they isolated VDPV. They used bioinformatic approaches to analyze their data, including maximum-likelihood and neighbor-joining trees. 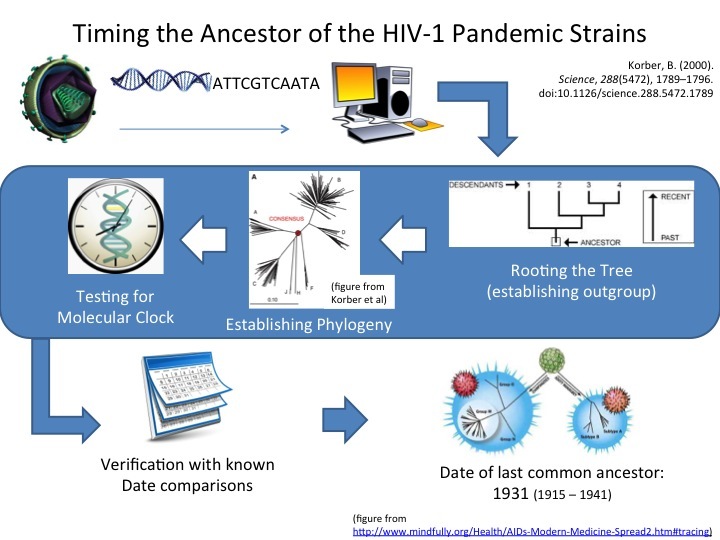 Using these methods they were able to figure out the timeline for this outbreak of the virus. How much impact did this paper have? According to Google scholar, this paper has been cited 441 times with the most recent being this year. I found two articles about the paper: one from the Telegraph and the other was a story from Reuters Health (I could not find the original article, but I found it on two separate forums). I think this paper is very influential, but it also has the potential to be used in ways that the authors did not intend. The paper emphasizes the need for continued vaccination and increased surveillance to further the effort of poliomyelitis eradication. However, it seems that this paper has also been picked up as fodder for those in the anti-vaccination movement (one of the forums was hosted by a group called The American Iatrogenic Association – a group focused on raising awareness for illness/ injury caused by physicians). Note 2 (also Oct 14): Christophe Fraser (@ChristoPhraser) pointed out that a short article in the Lancet in 2003 about SARS made exactly the same point as I do here. Note (added Oct 14): several people on Twitter told me that just now, the fraction of cases that is reported is going down, meaning that the data become more and more unreliable. I don’t know if this is true, but if it is, then no matter how we plot the data, they may not mean much. 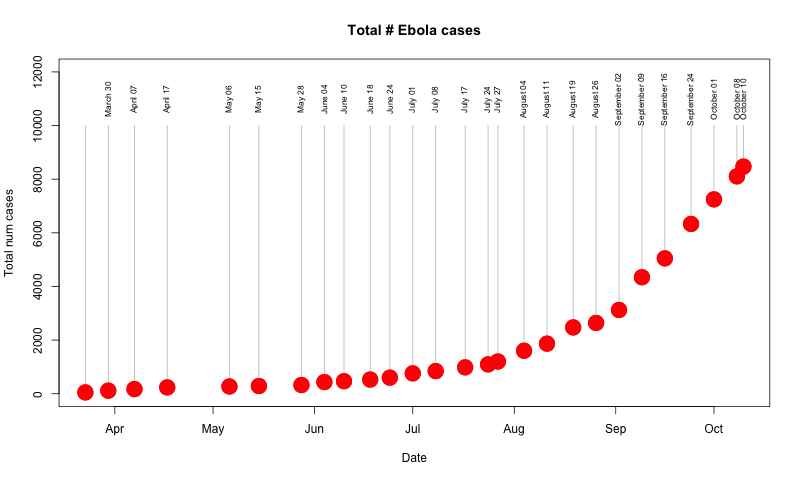 The other day, when I was writing about Ebola and airport checks, I noticed that one of the graphs on Wikipedia showed the number of new cases per week in stead of the total number of reported cases. Suddenly, the epidemic looked very different to me! Even though new cases are being found each week, the Wikipedia graph showed that the number of cases per week had been stable for a while. This is good news! Of course, we need the number of new cases per week to go down (and maybe it has just done that … says at least a Dutch newspaper), but even if the number is no longer going up, that is already a great improvement. 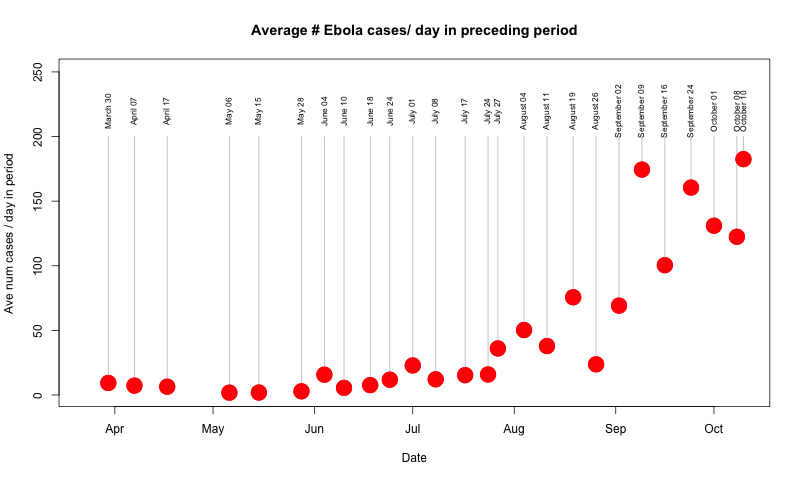 I decided to get some data from Healthmap using code by Ebolastats from their Github repository, and plot the number of new cases per day, averaged over roughly weekly periods. To me it looks like the number of new cases per day has been fairly stable since the week ending with September 9th. At the same time, if we use the same data to plot the total number of cases, it looks like the number is still increasing exponentially. However, if you just focus on the last 5 points, you may agree with me that you could fit a straight line through it. Note that the total number of cases cannot go down. When the epidemic is over, this curve will flatten to a horizontal line, it will not go back to the x-axis. I think most of us are used to looking at plots that show the number of cases per week or per month and so, even without realizing it, when we see a curve that is going up and up, we think that it means that the epidemic is getting worse, even if it is really stable. Therefore I don’t like the kind of plot that shows the total number of cases, because I think it looks much worse than it is. How many travelers need to be checked in order to prevent one case of Ebola in the United States? Note (added on Oct 12th): several of my colleagues think that my analysis is too optimistic. Specifically, they think that the epidemic is currently larger than the reported numbers and they think that the epidemic will keep on growing. I was planning to spend this week’s class entirely on discussing a polio outbreak in Hispaniola in 2000, but the students asked whether we could spend a little more time on Ebola. Of course I was happy to comply. I decided to ask the students to work in groups of three to estimate how many travelers would have to be screened at American airports to prevent one case of Ebola in the United States. The goal was to get a ballpark answer. I hoped that the exercise would give my students a feeling for the numbers in the Ebola epidemic. The answers they came up with varied widely. I think that for each Ebola patient that may be found by airport screenings, we’d need to screen at least 26,000 travelers. But if the epidemic grows much bigger than it is now, this number will go down. Here is a description of how this number could be calculated. How many people currently have Ebola, but are not yet too sick to travel? 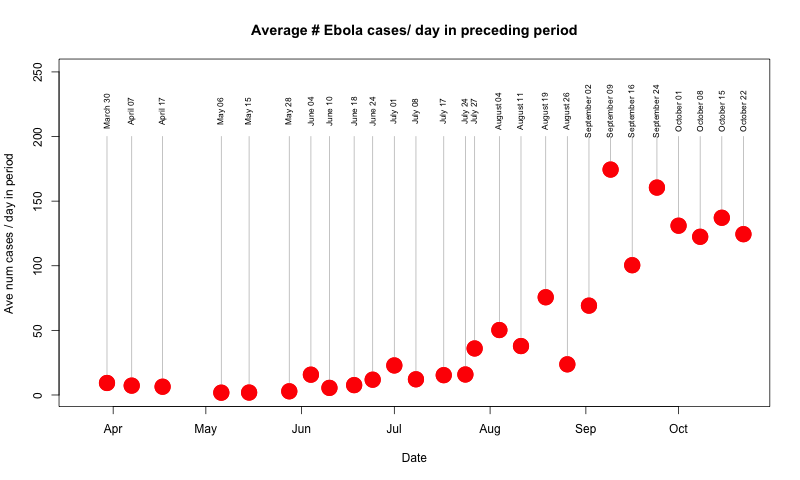 In the last couple of weeks there have been approximately 900 new Ebola cases per week, or 129 per day (link Wikipedia). 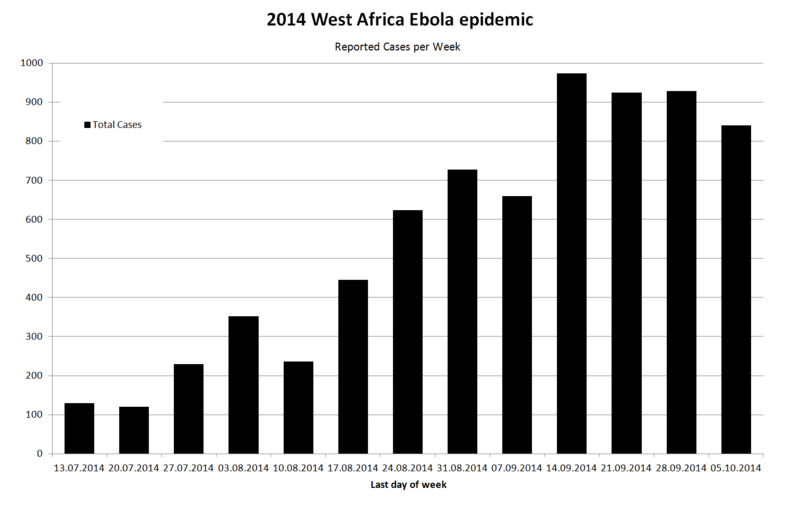 “West Africa Ebola 2014 Reported Cases per Week Total” by Malanoqa – Own work. The average incubation period of Ebola is 8 to 10 days (link CDC), so I’ll use 9 days for now. Each of the patients who get infected will therefore, on average, be asymptomatic for 9 days, meaning that on any given day, 129 x 9 = 1161 patients are infected but asymptomatic. After the incubation time, patients may show symptoms, such as fever, but may still be able to travel. I haven’t found any good information on how long this period lasts on average. In the case of Thomas Duncan, I understand that he went to the hospital for the first time on September 25th, and by September 28th he was vomiting all over the ambulance. I’d assume that he may have gotten a fever one or two days before the 25th, which means that he may have had symptoms for 5 days before he became too sick to travel. In the case of the Spanish nurse Theresa Romero Ramos, it seems that there were seven days between the moment she started feeling ill and the day that she was so sick she called an ambulance (link CNN). So, if we take the average from those two cases, it means that patients may feel sick and have a fever for six days before they become too sick to travel. This means that at any one point in time, 129 x 6 = 774 patients may have a fever because of Ebola, but could still travel. I therefore estimate the total number of people with Ebola, but still able to travel to be around 1161 + 774 = 1935. How does this number of infected people compare to the number of people in the affected countries? OK, so I now have a rough idea of how many people have Ebola at any one time, with or without symptoms, who could still travel. Next, let’s see how these numbers compare to the total number of people who live in the countries that are affected (Sierra Leone, Liberia, Guinea). From Wikipedia I learned that there are approximately 20 million people in the three countries combined. This means that, if you’d pick a person at random from one of the three countries, the probability that they have Ebola is around 1935/20,000,000 = 0.0001 (one in 10,000). The probability that they have Ebola with no symptoms would be 1161/20,000,000 = 0.00006 (one in 17 thousand) and with symptoms 774/20,000,000 = 0.00004 (one in 26 thousand). How many infected people could fly from West Africa to the United States? The next step is to look at how many people travel to the United States from the three affected countries. Several news outlets reported that around 150 or 160 people travel to the US from the three countries every day. If one in 10,000 people in infected, then we may expect that one infected person would travel to the US in the time that 10,000 people in total travel to the US. With 160 travelers per day, 10,000 people travel to the US in 10,000/160 = 62.5 days, or roughly two months. In other words, we should expect about one traveler with Ebola to arrive in the US every two months. If we split this up again in asymptomatic and symptomatic Ebola patients, we find that we should expect an asymptomatic patient (like Thomas Duncan) every 17000/160 = 106 days (3.5 months) and a symptomatic patient every 26000/160 = 161 days (5.5 months) arriving in a US airport. If the airports in the United States would check every traveler from West Africa for Ebola symptoms, I’d expect them to find one such patient every 5.5 months, in the time they screen 26,000 travelers. During that time it is quite likely that an asymptomatically infected person enters the US, because we should expect one every 3.5 months. It seems to me that a screening for fever or Ebola symptoms at US airports is not very useful. In fact, I assumed in my calculations that everyone is equally likely to travel, whether they have a fever or not, unless they become too sick to travel. This is probably not true, especially because everyone is already screened at the airport when they leave one of the affected countries. If someone already has a fever, they will not be allowed to board a plane. This means that the screenings at the US airports are even less likely to find Ebola patients. Screening may be useful for other reasons though. For example, it may the a good opportunity to provide information to travelers who have arrived from West Africa. I’ve assumed that the epidemic will stay at the size it is now (900 cases per week). I am not an epidemiologist and know little about Ebola, but there have been a steady 900 cases per week since four weeks, so I think it could stay this way. However, if the epidemic still grows, then there will also be more infected people traveling. However, no matter how big the epidemic gets, I think it will always be more likely that asymptomatically infected people arrive at an airport than then symptomatically infected people. There are two reasons for this: first, once symptoms start, people get quite sick quite quickly and may be unlikely to travel, secondly, everyone is already checked at the African airports. According to the New York Times, already more than 36,000 people have been screened as they left West Africa in the last two months. 77 of these people were not allowed to fly, but none of them turned out to have Ebola. Because everyone is already checked in West Africa before boarding the flight and, possibly again when they have a lay-over in Europe, it becomes even more unlikely than I initially calculated that someone with symptoms arrives in the USA. If 36,000 people have left the three affected countries by air in the last two months (I am not sure if this number is accurate as I have only seen it in the NYT, but let’s assume), then my calculations suggest that the expected number of patients among them would have been 3.6 (of course there can never be 3.6 patients, rather an integer number fairly close to it. I assume here that the epidemic was the same size over the last two months, even though it was a bit smaller in the first month). If we assume that only asymptomatic people travel, then the expected number of exported cases would be 2.1. As far as I know, there have been only two cases of people taking the virus with them on a plane: Thomas Duncan and the patient who took Ebola to Nigeria (link Wikipedia). Two is not significantly lower than the expected 3.6, and really close to 2.1. Wow, I did all this handwaving and made a ton of assumptions, and the real number is not too different from my calculated prediction! The reasonable fit between reality (2 cases) and the prediction (3.6 or 2.1) suggests that the data we have on the epidemic may be quite accurate. For example, if the epidemic really would be much bigger than reported because of unreported cases, then we should have seen more exported cases of Ebola. Of course, it is also possible that the epidemic really is much bigger, but one of my assumptions is not correct. For example, it may be that people who are infected with Ebola are not as likely to travel as other people. Please let me know if you find any mistakes in this post. When did HIV jump from chimps to humans? This week we read a paper published in Science in 2000 that attempted to estimate the date associated with the most recent common ancestor of the M group of HIV-1. This is of interest because it is likely that the jump of the virus from chimps to humans happened around the same time. The main conclusion of the paper is that HIV likely jumped to humans in the first half of the 20th century, long before the HIV epidemic was noticed. Just after we read it, a new paper came out in Science about the same topic (link), so maybe we’ll read that too! Here is some of the homework done by the students in my class. The paper wanted to understand the beginning and age of a type of bad thing that causes people to be sick. They did this by using strong computers to guess the age of the last family group of the bad thing. The paper believes that the bad thing can be followed back all the way to the US sad time. The paper didn’t find out how the bad thing jumped from animal to person. Some people thought that the bad thing started to cause people to be sick because some doctors used animals carrying the bad thing when they worked to help sick people. However, the paper found that the bad thing that causes people to be sick was present before doctors worked to help sick people. The first author, Bette Korber, is a current laboratory fellow and former staff scientist in the Theoretical Biology and Biophysics group at Los Alamos National Laboratory where she started in 1990. She received her PhD in immunology from Caltech, and did her first postdoc in retrovirology at Harvard before heading to New Mexico. She has been incredibly prolific, often appearing on > 10 papers/year, and the vast majority of her best-cited papers are related to HIV and its concomitant immunological responses as well as vaccine development. The last author is Tanmoy Bhattacharya, a PhD physicist who did his doctoral work at the Tata Institute of Fundamental Research in Mumbai before ultimately landing at Los Alamos National Laboratory in the early 1990s as a postdoc and now staff scientist. Also, as of 2006, a professor at the Santa Fe Institute, his research interests are diverse, including investigations of phenomena related to quantum field theory, hadronic physics, and – importantly for this paper – large scale computation as applied to phylogenetics. Many of his most recent papers, in fact, are within the realm of phylogenetic analysis, although he has maintained a hand in physics throughout his publication history. Randomized placebo-controlled clinical trials are often large and very complex, but they don’t have to be, according to professor Joanna Masel. In an article for Scientia Salon, Masel argues that the few doses of ZMapp that were available to treat ebola patients should have been used for a small clinical trial. Even a very small trial is better than no trial at all. That this didn’t happen is a missed opportunity. Ebola is a horrible disease and, as you can’t have missed, there is an epidemic going on in West Africa. About two-and-a-half thousand people already died of ebola in the last couple of months. There is no drug to treat ebola patients. At least, there is no drug of which we know that it works. There are a few experimental drugs, of which ZMapp is the best known. ZMapp consists of a mixture of three monoclonal antibodies. The press wrote a lot about whether ZMapp should be used and who should get the first available doses. Because Ebola is associated with a very high mortality (>50%), experts agreed quickly that ZMapp should be made available to patients, even though it hasn’t gone through all the usual tests. Another question was who should get the first doses. If Africans would be the first to be treated, then the risk would be that it would be seen as using Africans as guinea pigs for a new drug. However, if non-Africans would be treated first, it could look as if whites were given priority. This is not easy decision. ZMapp in a small trial? Another discussion received less attention. ZMapp has never been tested in a clinical trial. But if we are going to give ZMapp to people, shouldn’t we use the opportunity to do a randomized trial right away? In such a study we can find out whether ZMapp is saving lives and we can potentially save lives at the same time. Professor Joanna Masel from the University of Arizona suggested the following: if you only have six doses , and many more sick people , then obviously most of the sick will not get the medicine. That’s terrible. But, she says, let us try to make the best of this bad situation. Let’s not pick six, but twelve people who qualify for the medications. And then lets give a placebo to half of the twelve and the real medicine to the other half. In this way we do a very small randomized, placebo-controlled clinical trial. And if we are lucky, the results of that trial will tell us whether the drug works. But wait, we can hear the critics say, isn’t a study of twelve people far too small? In her article, Masel uses standard calculations (see also here) to determine whether a trial with twelve patients would make sense. It turns out that if the drug works extremely well, so that everyone gets the drug also survives, then in a study with twelve people we have an 80% chance that we find a significant difference between the placebo and ZMapp. And 80% is pretty decent for a clinical trial. By now, the available doses have all been used. It is said that ZMapp has saved lives (link), but no one knows for sure. The patients who received ZMapp were probably in better condition and were treated in better hospitals than the average ebola patient. We don’t know what the real effect of ZMapp was. That’s a missed an opportunity. There are simple tools that calculate the power of clinical trials. The screenshot is from a website http://www.sealedenvelope.com .